Either way, in a note today, Cit’s Tobias Levkovitch looks at the M/O ratio, which is the ratio of the middle-aged (40-49 year old) cohort vs. the old-age (60-69) cohort,a nd notes an interesting similarity between that ratio and S&P PE ratios. 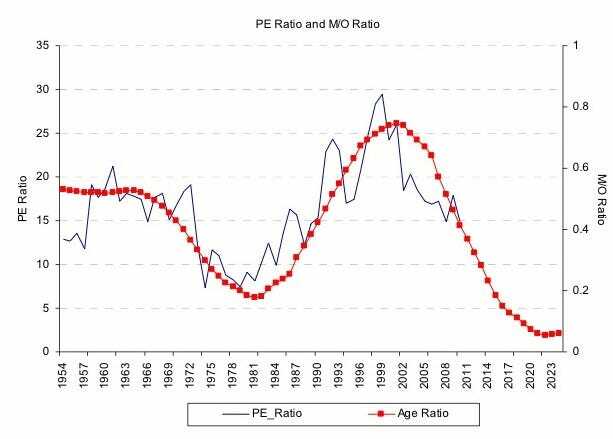 Not surprisingly (we supposed) as the number of high earnings/high consuming middle-agers rises and falls in relation to old agers, stock market valuations rise and fall. And if you believe the inexorable move in the red line (down), then you’d surmise that PEs are going lower as well. Please follow Money Game on Twitter and Facebook. CHART OF THE DAY: Rise Of The Stock Vigilantes! Subscriber to receive the newsletter and other relevant information.